Approximate Image Sizes: 1. Small Poinsettias: 3.5" x 2.25", 2. Mini Poinsettias: 3.5" x 1.75", 3. Small Holly and Berry Clusters: 4.0" x 1.5", 4. Mini Holly and Berry Clusters: 3.75" x 1.0". 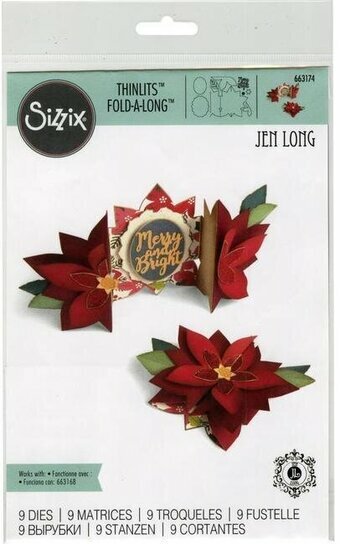 Christmas themed craft die featuring poinsettia flowers. This is a set of 3 dies. They measure 1, 1-1/4, and 1-1/2 inches in diameter. These dies are compatible with most tabletop die cut machines. Festive Collection - Poinsettia Filigree Frame. 4 dies. 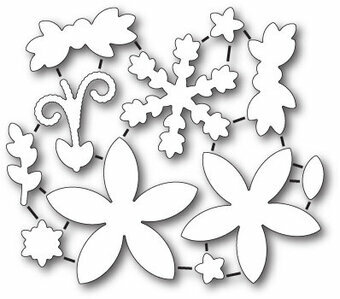 Cut shapes into your cardstock when you use the filigree dies only. Cut the frames out completely when you use them with their coordinating outline die. 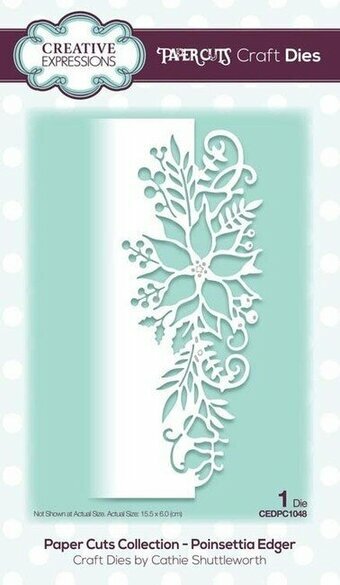 Use the outline die alone for a solid background shape to add colour or glitter showing through the filigree openings. Size: 4.13" x 3.38". Christmas themed dies featuring poinsettias. Memory Box/Poppy Stamps craft dies are made of 100% steel. For use on cardstock, felt, and fabric. Cut, stencil, emboss, create! Use in most leading die cut systems. 1.3" x 1.2", 1" x 1", 0.7" x 0.8", 0.6 x 0.5", 0.3" x 0.3". Memory Box craft die featuring Poinsettia flowers in a circular frame. 100% steel craft die from Memory Box. For use on cardstock, felt, and fabric. Cut, stencil, emboss, create. Use in most leading die cut systems. 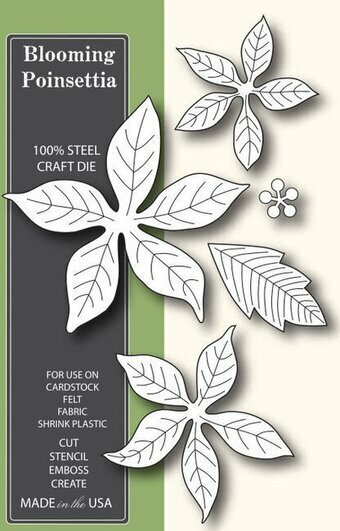 100% steel craft die from Memory Box featuring three candles and a beautiful poinsettia flower. For use on cardstock, felt, and fabric. Cut, stencil, emboss, create. Use in most leading die cut systems. 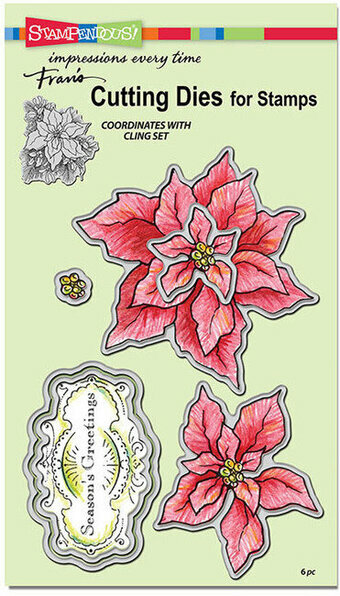 Christmas Themed Penny Black Craft Die featuring a Poinsettia flower. Christmas themed Poppystamps craft die featuring Poinsettias. 2.2 x 2.6, 2 x 1.7, 1.2 x 1.4 inches. Christmas themed craft die featuring a Poinsettia Wreath. Memory Box/Poppy Stamps craft dies are made of 100% steel. For use on cardstock, felt, and fabric. Cut, stencil, emboss, create! Use in most leading die cut systems. 3" x 3", 2.4" x 2.4", 1.8" x 1.8", 0.9" x 1.8", 0.5" x 0.5". 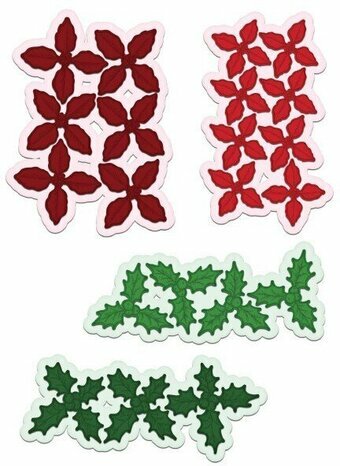 Use this easy die set with our Create a Poinsettia stamp set to make piles of gorgeous poinsettias this Christmas holiday. 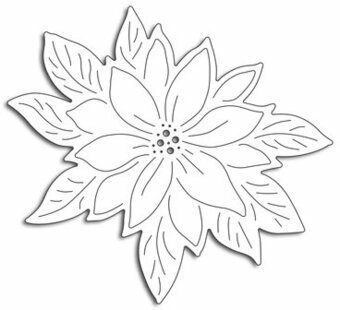 These dies cut the flower out at three different levels plus the center so you can layer and layer to create beautiful, dimensional flowers. 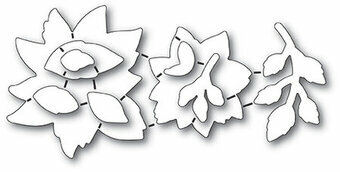 The greeting die cuts and layers the beautiful greeting with ease. 6 precision wafer thin dies. 100% steel craft die from Memory Box. For use on cardstock, felt, and fabric. Cut, stencil, emboss, create. Use in most leading die cut systems. 3.6" x 3.5". 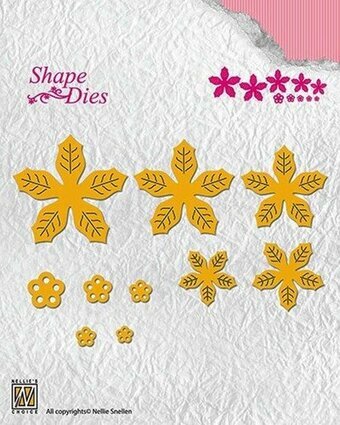 100% steel craft die from Memory Box featuring a gorgeous band of poinsettia flowers. For use on cardstock, felt, and fabric. Cut, stencil, emboss, create. Use in most leading die cut systems. 100% steel craft die from Memory Box. For use on cardstock, felt, and fabric. Cut, stencil, emboss, create. Use in most leading die cut systems. 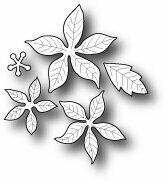 2" x 2", 1.9" x 1.7", 1.5" x 1.3" leaves, 0.1" diameter. Approximate Image Sizes: 1. Decorative Vase: 2.25" x 2.75", 2. Ornamental Beads: 2.5" x 1.5", 3. Christmas Ornaments: 2.0" x 2.25", 4. Pine Greenery: 2.0" x 1.25", 5. Mini Poinsettia: 1.0" x 1.0", 6. Pine Cones: 1.5" x 1.0", 7. Pine Cone and Greenery Cluster: 2.0" x 1.75", 8. Holly Leaves: 2.0" x 1.0". Christmas themed Poppystamps craft die featuring Poinsettias. Winter themed Penny Black Creative Die featuring a Stitched Poinsettia. 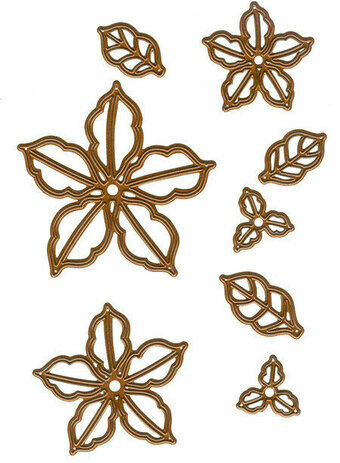 Add a steampunk flourish to your Christmas designs with the Industrial Chic Poinsettia die set. Designed by Sue Wilson. The Industrial Chic collection is an elegant collection of high quality steel dies designed to co-ordinate with each other. Includes 12 dies. Size: (Largest) 2.7 x 2.7 (Smallest) 1.2 x 0.7 in. 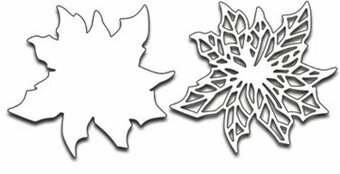 The brand new Festive Foliage Die set from our fabulous Moonstone Die Range has been created to work seamlessly with our wonderful Little Books. The set contains 9 different dies, including a stunning oval wreath frame with gorgeous foliage detail around the edge. 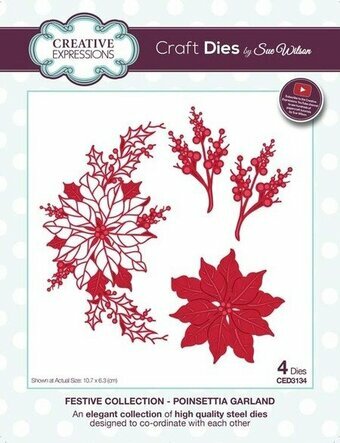 The set also includes all the elements you need to create a beautifully dimensional poinsettia. There is pretty debossed detailing on the wreath frame, adding a gorgeous stand-out effect that looks stunning when coloured. 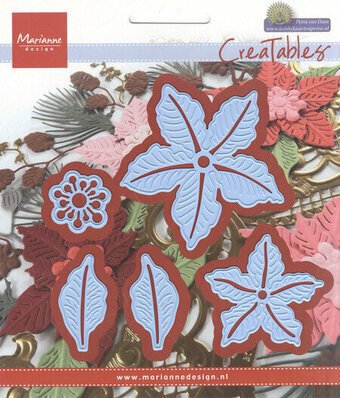 You can even use these dies with coloured card or mirri card, to create limitless unique looks on your projects. These fabulous dies give a fantastic crisp, clean finish (we recommend putting the die through portrait and then rotating and putting through landscape for the perfect cut). Please be advised these dies are not suitable for use with A5 cutting machines. Largest Die: 12.9cm x 16.3cm / 5.07" x 6.41". 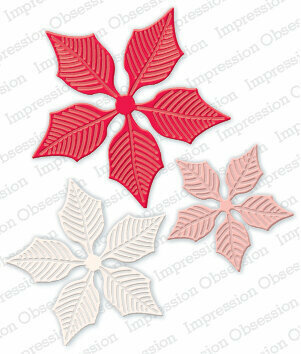 Frantic Stamper Precision Die - Festive Poinsettia. 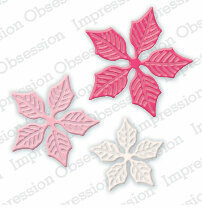 The Festive Poinsettia die is a set of 2 dies which can be used to create a layered flower. Stack 2 or 3 layers of the solid flower for added depth, and use the outline layer for softness. Each flower is 3.25" at the widest point. 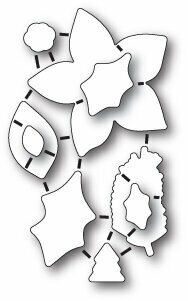 Use the die cuts flat, or shape the petals for a truly stunning look! Our Frantic Stamper Precision Dies work in most consumer table top die cutting machines such as the PressBoss, Cuttlebug, Big Shot, vagabond, Boss Cut, and Grand Calibur. Some dies may require the use of a metal shim depending on your machine. 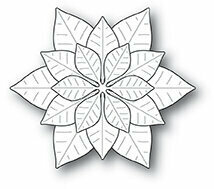 100% steel craft die from Memory Box featuring a pretty poinsettia flower. For use on cardstock, felt, and fabric. Cut, stencil, emboss, create. Use in most leading die cut systems. Christmas themed craft die from Memory Box featuring a Christmas Ornament. For use on cardstock, felt, and fabric. Cut, stencil, emboss, create. Use in most leading die cut systems. 2.5 x 5 inches. Christmas themed craft die featuring a Poinsettia Ornament. Christmas themed craft die featuring a Poinsettia Oval frame. Christmas-themed craft die featuring a poinsettia flower. Memory Box/Poppy Stamps craft dies are made of 100% steel. For use on cardstock, felt, and fabric. Cut, stencil, emboss, create! Use in most leading die cut systems. 2 dies included. Christmas-themed craft die featuring a poinsettia flower, leaves, a small Christmas tree, and more. Memory Box/Poppy Stamps craft dies are made of 100% steel. For use on cardstock, felt, and fabric. Cut, stencil, emboss, create! Use in most leading die cut systems. 32 dies included.